Summer 2016 turned out to be a very decent season overall, the mean temperature of 18.7C (1.1C above average) made it the sixth warmest summer since 1797. While it wasn’t quite up there with the hot summers of 1976 and 2003 it still produced some notable records. The stormy beginning to June effectively ended with the Brexit vote, a period of 24 hours that coincided with the highest daily rainfall this area has seen since at least 1959. The multi-cell thunderstorm in the early hours of June 23rd produced 60.8mm of rainfall, nearly half of the month’s total which became the third wettest June in a record going back to 1797. The high rainfall was in complete contrast to July and August and helped skew the overall figure: 168.6mm is 114 per cent over average summer rainfall. With so much rainfall overall sunshine was affected with only 451 hours recorded, just 80 per cent of what can be expected in an average summer. July produced another record, this time the highest overnight minimum recorded since 1959. The minimum of 21.1C was recorded during the early hours of the 20th – coming hours after the hottest day of the year: 33.5C – the 14th hottest day on record. The warm and very dry theme continued into the final month of summer with the warmest August for 12 years, the 10th warmest and 12th driest since 1797. My summer forecast, when the monthly probabilities are considered, was broadly correct though I didn’t estimate correctly just how warm it would be. The past week has produced the highest 24-hour rainfall total recorded in Wanstead since at least 1960. The multi-cell thunderstorm on Wednesday night saw 60.8mm fall, most of it in two hours, bringing flash floods to the surrounding area. The spectacular lightning and thunder that accompanied it was almost a side show such was the intensity of the rainfall. I was unfortunate enough to be riding home right in the middle of the event: the entire length of the Mile End Road bore a resemblance to a shallow river, the heavy rainfall bouncing back off the Tarmac high enough to create what felt like a powerful drench shower. The legacy of the downpours caused chaos in the morning and evening rush-hours. Many commuters were stranded at London terminals including Waterloo station because of flooded tracks, possibly robbing many of the chance of voting in the EU referendum. It will never be known if this would have had a bearing on the final result. Many people think of June as a warm, summery month. The term Flaming June is regarded in most peoples’ subconscious as a reference to past weather. That it is a actually the name of a painting is often missed. Looking back through our local history there has been many notable events of thunderstorms and prolonged rainfall. 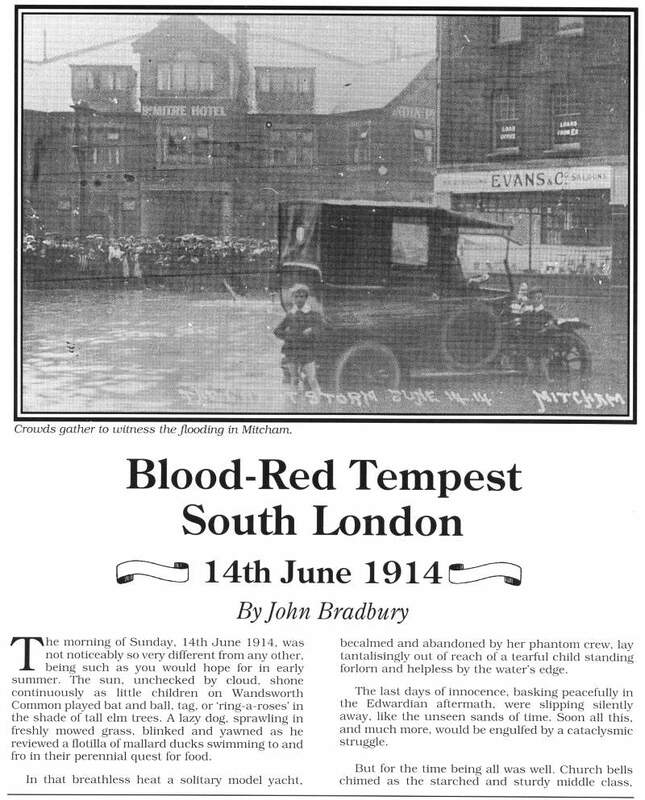 In 1903 a record-breaking 59-hour deluge left vast swaths of the borough inundated. This weekend 200 years ago, during the Year Without a Summer, a powerful tornado, strong enough to carry away objects weighing 60lbs, tore through the Edgware Road area in west London. Luke Howard recorded the event in the Climate of London. At two o’clock being a still sultry day a whirlwind passed over the nursery ground of Mr Henderson in the Edgware Road which lifted seven lights from the greenhouses and carried them to the height of the highest elm trees, each of the lights weighs 50 or 60lbs at least. At the same time two garden mats were carried to an immense height so that the eye could not distinguish them. The following day “extremely heavy and prolonged rain from 9am (26th) to 9am on 27th gave 2.95 inches”. This total of over 52mm is notably high though not a record. This weather was a continuation of what had been an awful May and June – cold with more than twice the average rainfall in June. The weather then was not unlike what we have experienced this month. Indeed, a look at the weather throughout this year was similar as this graph shows. Though the mean temperature at times bears a close resemblance this year is no comparison to 1816: The mean then was running at 6.2C, over 3 degrees colder than today. Mean pressure was also lower being 992.1mb; the 2016 mean 9am pressure is 1010.6mb. Perhaps not surprisingly this year’s rainfall actually trumps 200 years ago; the running total for rainfall here is 390.1mm, higher than the 309.6mm recorded in 1816. The dreary summer and frequent thunderstorms of 1816 inspired Mary Shelley to write Frankenstein. A summer vacation in Switzerland led her to spend much of the time indoors. She, along with Lord Byron and John William Polidori entertained each other with a contest to write the scariest story of all. The unseasonal conditions, along with this dare, led to the creation of Shelley’s Frankenstein: The Modern Prometheus— as well as Polidori’s novella The Vampyre and Byron’s long-form poem, The Darkness. It will be interesting to see if this June’s weather, along with momentous political changes here and in Europe, produce more fine fiction from the this and the next generation of writers. It was just before 3am that I was awoken by faint rumblings outside. I knew there was a risk of thunder before I’d retired to bed a few hours earlier but I’d discounted the risk along with any thoughts of staying up to watch the referendum results unfold in Scotland. Lightning then illuminated the room through the gaps in the curtains followed by more rumblings: it’ll pass, I thought. Crash – I grabbed my phone – was this an isolated event? The radar showed a line of slow moving storms moving up from the south. More lightning and loud thunder. My Twitter feed told me it wasn’t going too well for those wanting independence. At this point intensely bright lightning was rapidly followed by one of the loudest claps of thunder I’ve heard around 3.10am. Car alarms were set off – may as well get up I thought… The Inverclyde result was announced – ‘No’, by the narrowest of margins 50.1% to 49.9%. That’s it then, I thought. The lightning and thunder gradually began to fade away with hopes of an independent Scotland, on this night anyway. I glanced at my stats which seemed far less impressive than what was recorded elsewhere: 7.7mm, no big fall in temperature or pressure like previous storms during the summer. Just a few hours later I walked my younger daughter into school, my bleary eyes struggling to focus – the humid and steamy atmosphere felt more like July than September. Indeed Thursday had been the warmest September 18th since 1997 which, strangely, was the same year that another momentous British event took place: the handover of Hong Kong to China. I remarked to a couple of parents that the only thing that had changed overnight was that Andy Murray will forever be the “Scottish” tennis player after his comment on Twitter. The forecast advised that there was a continued threat of thunderstorms. It was humid but it didn’t ‘feel’ stormy – though around 2.30pm I could hear the beginning of faint rumblings in the distance. I left for work on my scooter at 3pm, carefully watching the sky for any developments all of which seemed to be in the distance. After stopping for petrol in Leytonstone High Road huge drops of rain began splattering the pavement. They were few and far between, however, and the sun defiantly continued to shine. After riding past Stratford I suddenly became aware that the buildings in the distance, past Bow flyover, were gradually beginning to disappear. I pulled in to a turning where Gala Bingo is situated. An electronic noticeboard enquired: “Do you feel lucky?” Not today I thought and retrieved my overtrousers that live under the seat, hastily pulling them on as I watched the impending storm begin to close in. 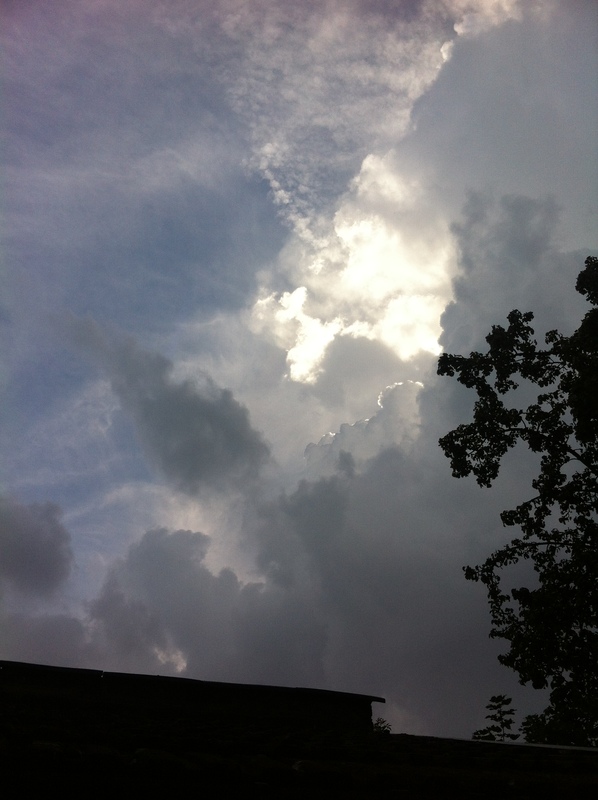 I continued on and was soon enveloped in the full force of another thunderstorm. Marble-sized hail clattered off my crash helmet while dangerous gusts, caused by wind funneling through the new high rise flats by the Olympic Park, did their best to push me off. Just as I crossed the canal a sheet of rain engulfed me and the drivers to my right. The road in front suddenly turned into a shallow river. I usually ride over the flyover – not today with the torrent of water cascading off the sides. 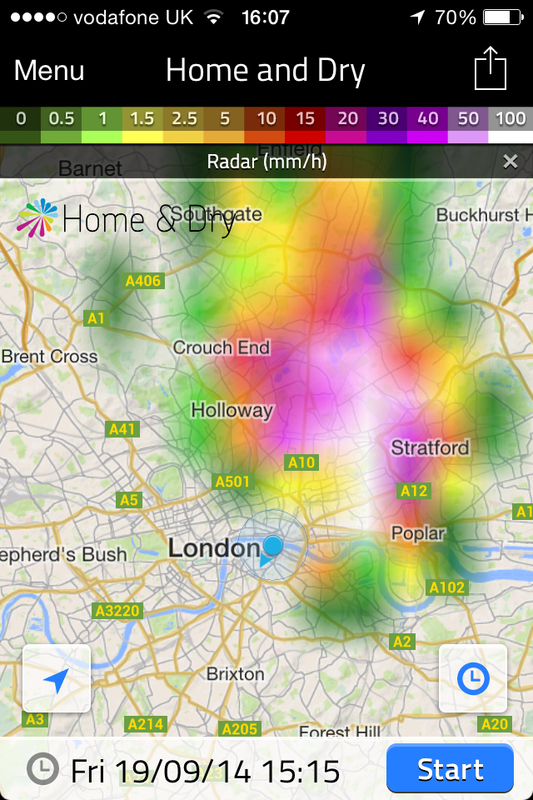 I checked the stats of the storm back in Wanstead: 24.5mm fell with a peak rate of 76.5mm/hr at 15.47. The storm ended a run of 16 dry days bringing the total for the month up to 33mm – the 24hr total was 30.5mm. The explosive convection of this storm can be seen here. 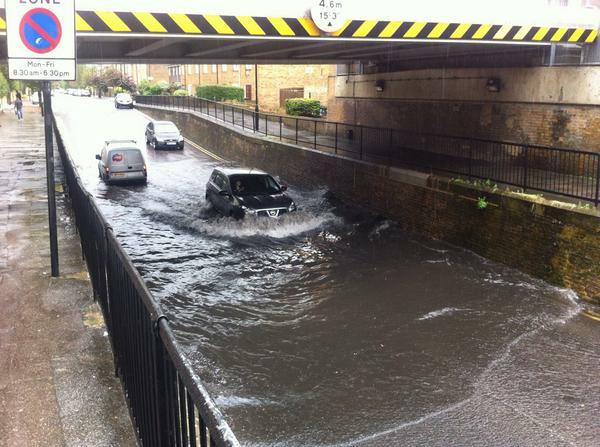 The associated hail and rain brought much flooding to Hackney, Hackney Wick and Leytonstone. 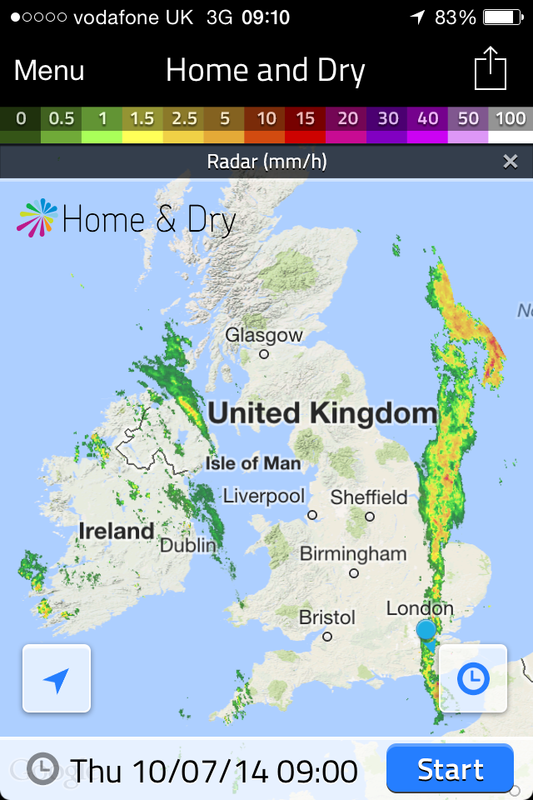 This storm seemed to be the result of a convergence line over London between light southerlies to the south and easterlies to the north – the heavy rain was very localised. 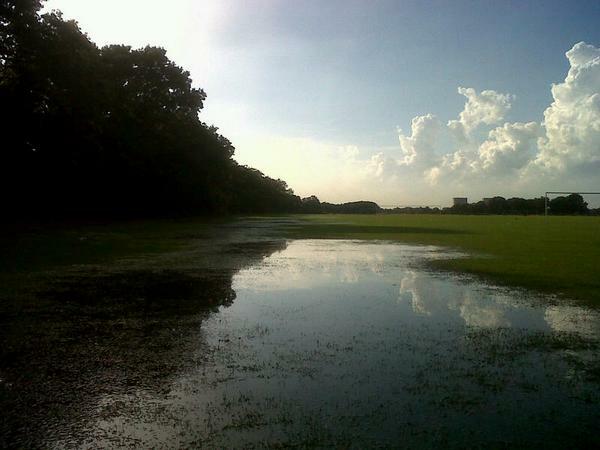 Flooding images can be seen on the following links at Dalston, Wanstead Flats, Leytonstone Station, Wick Road. A short clip of flooding at Wick Road can be seen here. The flooding wasn’t restricted to East London. In Southend water started pouring through the roof of the Dixons theatre though it failed to stop the performance. Shops in London Road were inundated. July 2014 was yet another milder than normal month; the mean temperature of 20.2C was 1.7C above average, making it the 9th warmest July since 1797 – and 0.5C cooler than last July. The month was marked with spectacular thunderstorms and torrential downpours, contributing to what was a much wetter than average month – some 73mm fell which is 168% of the monthly average. While on paper the month looks very wet it should be noted that 52% of the July total fell in two episodes: a stalling warm front on the 10th and a cloudburst on 25th. I was away for the thunderstorm though a friend remarked that the roads close to Redbridge Roundabout were like torrents, the rain was so intense for a short period. I’ve put together a series of radar images that show the evolution of the storm, together with graphs, that can be accessed here. The hottest day was July 18th with 32.7C recorded. There were 12 occasions where the mercury reached or exceeded 80F – pretty respectable though last July saw that figure reached on 20 days! The sunniest day was on the 3rd when 15 hours of sunshine were recorded. Throughout the month there were 11 days with 10 hours or more of sunshine. There were also 5 days with thunder recorded – the average for July is 3. Looking further afield there were many thunderstorms around the UK though many places missed out on the big downpours. Perhaps the most impressive was the development of the MCS that moved up from France during the evening of July 18th. There were numerous superb pictures but my favourite is probably this shot taken by Richard Dixon in Whitstable, Kent. It shows, perfectly, the contrast betweeen the bright orange sunset and the impending doom of the approaching MCS from the continent. A thunderstorm on Sunday, July 20th, saw three inches of rain fall on Canvey Island in a very short space of time. A good round up of events, including pictures, can be seen here. The thunderstorm on 25th was felt across London and the Home Counties – there’s an excellent picture of the approaching shelf cloud here. Brighton was rudely awoken by a storm on 28th by a slow-moving thunderstorm. It is a typical feature of summer that rainfall can vary a great deal across a small area. The nearest official station to Wanstead, St James’s Park 8.4 miles to our south-west, recorded recorded just 25.9mm – 35% of what fell here. The nights were mostly warm – the 14.8C average is higher than last July. 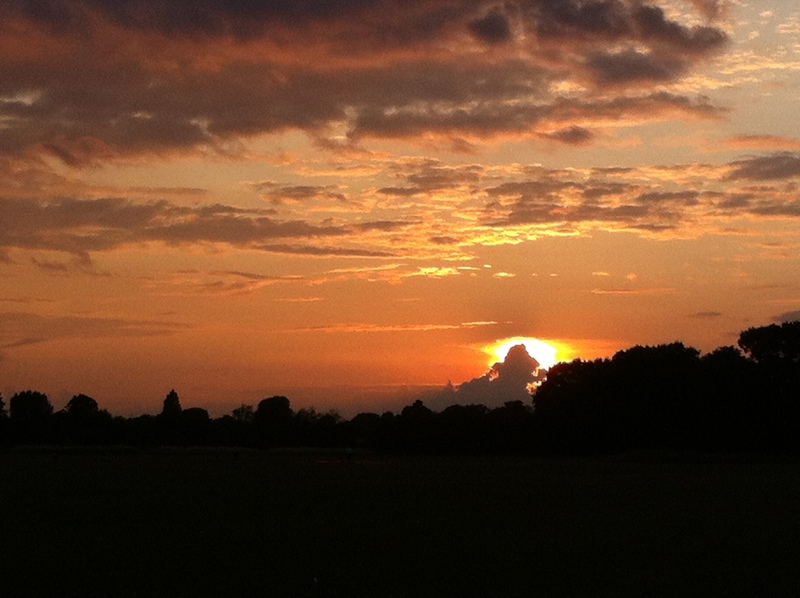 Overall July was a superb summer month – sunshine, heat, thunderstorms in abundance. I’ve decided to cobble together a few lines on last night’s notable thunderstorms which reminded me so much of the stormy nights on the 1980s. After writing off the risk of storms for our area last night I was awoken at 3am by loud, rumbling thunder – the kind that seems to resonate all around you. A quick look on the radar revealed quite a widespread thunderstorm, quite different from the smaller, more intense one that woke up most of Wanstead on July 23rd last year. 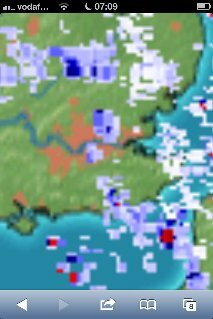 On viewing the live lightning map at 3.10am it became clear that this was no flash in the pan. Further rumbles and strikes had me leaping out of bed to monitor the station. 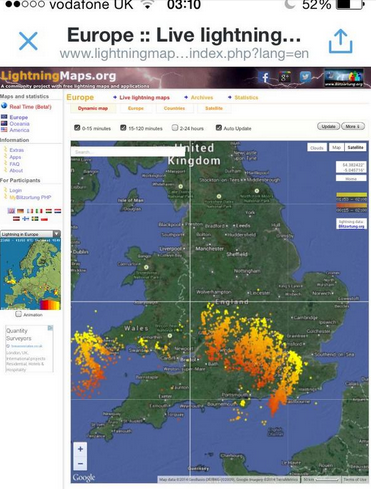 EssexWeather reported 1809 lightning strikes in two hours for our region. And on viewing the pressure graph the first storm saw a 6mb fall in pressure in a matter of minutes. A second storm around 5.30am was less severe though still notable. The 9.4mm that the weather station recorded fell at a rate of 45mm/hr at 3am and 40mm/hr at 5.15am. Though the AWS is often out in heavy rainfall situations on this occasion it was more or less spot on – my 10am reading of my traditional 5″ raingauge revealed the official total to be 9.3mm. The rain took the July total to 108% of the 1981-2010 mean. And a squall that blew through just before 4am is well portrayed on this wind graph. So, all in all, a really lively sticky night where the temperature didn’t fall below 18.2C. I didn’t manage to get any of my own pictures but this one by @justinstokes on Twitter caught my eye. Over the years significant weather events have, at least in my subconscience, at times signalled that something ‘big’ is about to happen – just one example being the Great Storm in October 1987 that was followed days later by the Black Monday stock market crash. So an event that happened 100 years ago this month, to some, probably also brought a feeling of impending doom as the political situation in Europe became ever more fraught. 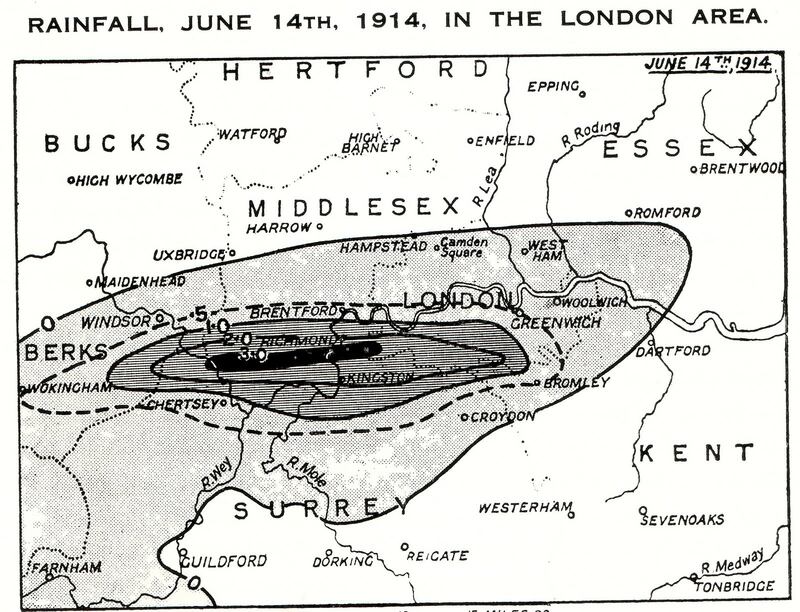 A series of severe thunderstorms that broke out just after midday over south-west London on June 14, 1914, left people dead and a trail of destruction across areas south of the Thames. Fierce lightning, torrential rain, severe flooding and hail ‘the size of walnuts’ accompanied the storms. 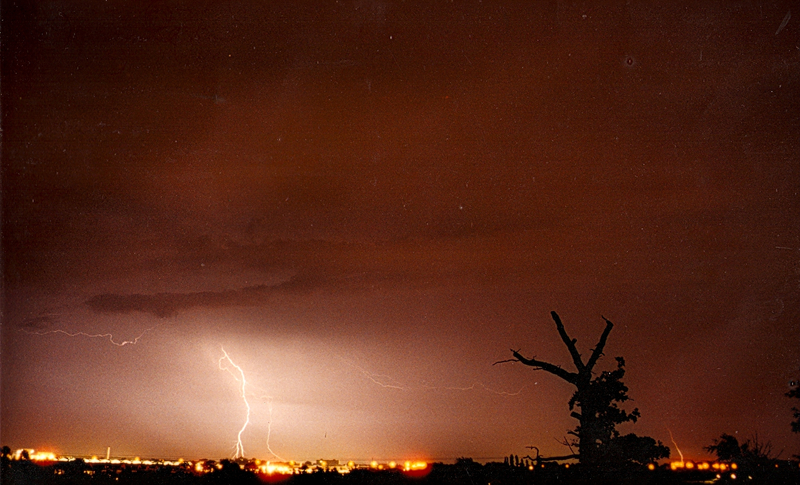 Seven people were killed by lightning on Wandsworth Common and four others were injured. As with many thunderstorms the heaviest rain, 94mm in 3 hours at Richmond Park, was focused over a small area. South Kensington, just over 5 miles away, recorded just 6mm! I don’t have the figures for Wanstead but judging by the map published in the 1914 edition of British Rainfall it probable recorded even less than South Kensington. Dulwich: Violent hailstorms. Many hailstones were like acid tablets about one inch long, half an inch broad and over a quarter of an inch thick. A minute or two after these had fallen, a mist rose to a height of about 4ft above the ground. Lewisham: A storm began at 12.24pm and came right overhead from the east with terrific flashes of lightning and loud thunder. At 12.31pm, rain fell with extraordinary fury; within 9 minutes 0.5 inches had fallen. The second storm came up just after 1pm, the lightning being even more severe. At 1.30pm, St Mark’s Church, and the Holy Cross were struck. A tree in Hither Green cemetery over 30ft high was splintered and two houses were struck at Catford. Another thunderstorm came up at 2.25pm with torrents of rain and hail as large as haricot beans fell for 5 minutes. 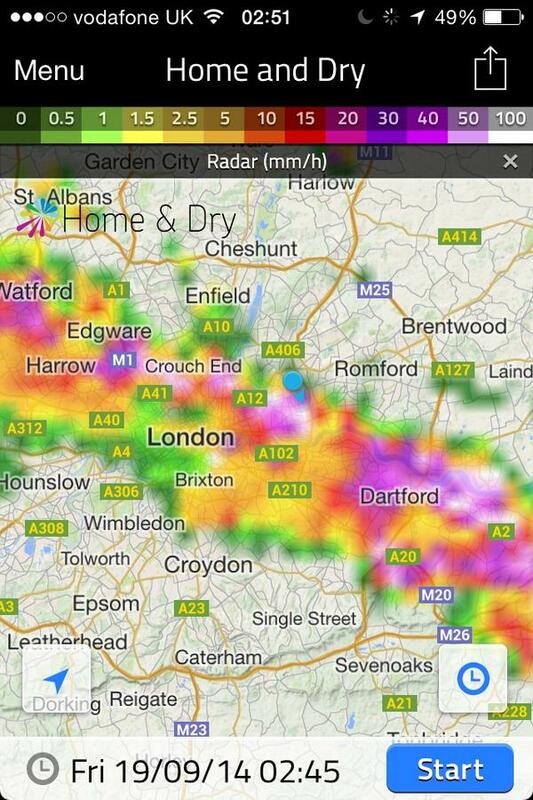 Richmond Park: Very severe storm passed over the house; an oak fence was struck by lightning in two places. Rainfall measurements were as follows: 1.80 inches in 45 minutes, 2.70 inches in 90 minutes, 3.2 inches in 2 hours, 3.60 inches in 2.5 hours, 3.70 inches in 2.75 hours. Wimbledon Downs: There was a curious scene close to Kingston station, where the water was about 4ft feet deep at five o’clock and motor cars and omnibuses had to make a wide detour. The storm was especially severe in Wimbledon district, where, owing to the bursting of an overtaxed sewer, the District Railway line was submerged. At Tooting Junction station was a foot deep on the platform. Judging by the 1881-1910 average 1914 was a warm year: the mean temperature of 10.7C was a full degree warmer than average. It was also 15 per cent wetter than average and the sun hours were nearly 108% of average. Of course by today’s standards (the 1981-2010 average) 1914 looks relatively cool as the average annual temperature has risen 1C in the past hundred years. The weather on this day must have been synonimous with the deteriorating political situation in Europe: two weeks later Franz Ferdinand, Archduke of Austria, and his wife Sophie were assassinated in Sarajevo by a young Serbian nationalist Gavrilo Princip , the casus belli of the First World War. What is fascinating is that a similar thunderstorm that left seven dead in Valentines Park, Ilford, 75 years ago this August, also happened about two weeks before Prime Minister Neville Chamberlain announced on September 3, 1939, that Britain was at war with Germany. The last time January was so wet Eddie ‘The Eagle’ Edwards was about to fly the flag for Great Britain in the ski jump at the Winter Olympics in Calgary, Canada, in 1988. Some 130.6mm of rain (251% of average) fell in January, beating the previous record set in 1988 by just 2.8mm around midnight on Saturday 1st. Unlike 1988, last month followed a December that was 154% wetter than average. The wet spell, which started on December 13th, is only now making a real impact on the river Roding which is now running very high. January was also warmer than average with a mean temperature of 6.4C (1.5C above the 30-year average) – ranking it 20th in the series since 1881 – and the warmest January since 2008. Though the month was very mild no single day was particularly mild. Highest maximum was 12.7C on the 7th. The most notable day was probably Saturday 25th when what started as a bright, fine day quickly changed around 4pm as a strong squall with heavy rain blew through with associated thunder and lightning and 6C fall in temperature in an hour. Wanstead escaped the damage of elsewhere. Numerous trees blocked rail lines in Kent and gusts of over 60mph were widely reported. There were two other incidents of thunder and lightning on 5th and 6th – very unusual in the middle of winter and an average normally observed in high summer. One of the worst weather-related tragedies ever to hit the London area happened 75 years ago this month. 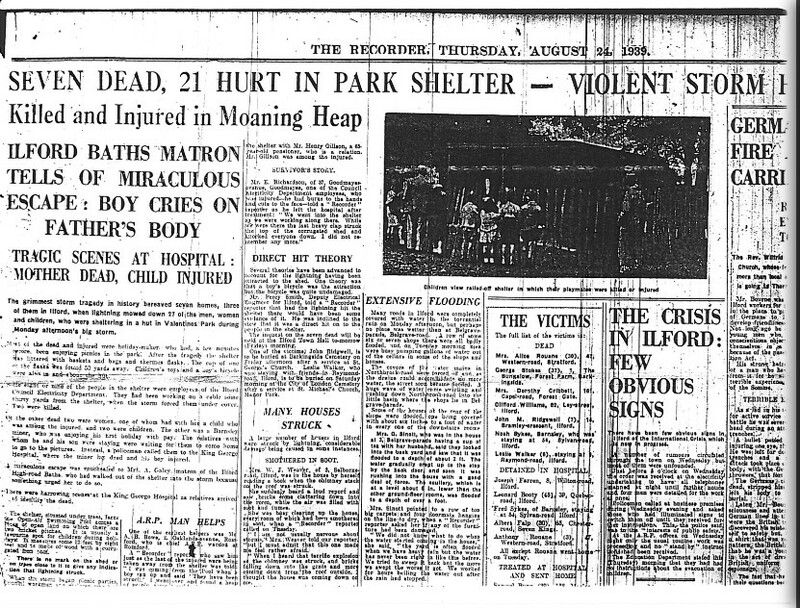 What started as a bright and sunny day in Valentines Park, Ilford, turned into disaster at ten minutes to five on Monday, 21 August 1939, when lightning struck a corrugated iron shelter where about 30 people, many of them children, had taken cover from a thunderstorm. Seven people, including five adults and two children, were killed and 21 injured in the incident near an open air swimming pool where earlier families had been enjoying picnics. Among the injured were a number of electrical workers who had been repairing a cable which ran through the 150-acre park. Neither the hut, which measured about 20ft by 12ft and had a sloping galvanised iron roof, or the two trees immediately behind it, were damaged. Another helper was Mr H.G.B. Goater, of Eastern Avenue, Ilford. He had also been to the pool and was attracted to the scene by the screaming. “It was like a battlefield. I have seen nothing like it. The dead and injured were in a heap in the shelter.” Mr Goater spent several hours going back and forth to King George hospital with his car, first taking the injured for treatment and then waiting to take home some of those who were allowed to leave. The storm also affected the Barkingside area. As the rain fell in torrents a chimney stack on two houses in Tomswood Hill was struck by what an occupant of the house described as a “ball of fire that crashed on to the roof and came zig-zagging though the front room and out of the scullery door”. Elsewhere in London severe flooding in Ealing is mentioned in The Times. 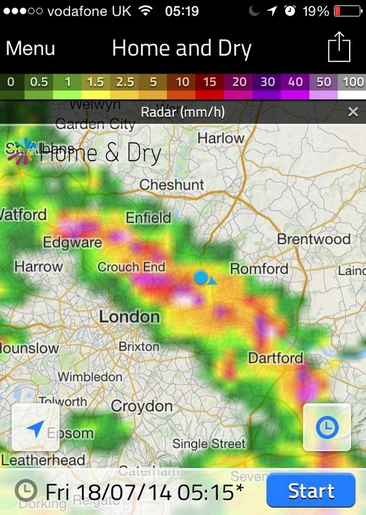 And large hailstones were reported in Surrey. Rainfall in thunderstorms varies greatly – and this storm was no exception. Met Office rainfall data from the day shows that Loxford Park, the closest rainfall station to Valentines Park about a mile to the south-east, recorded 30mm – almost double that of City of London Cemetery, just over 1.5 miles to the north-west of the storm’s centre, which recorded 15.7mm. In view of the rain and the lightning strikes which happened less than a mile away, across the River Roding, Wanstead had a lucky escape that day. While researching this I found it strange that local memory of the incident is very vague. The oldest generation of my family, a few of whom lived off Ilford Lane, cannot recall the incident though I believe quite a few had already moved out of London as part of the evacuation before the Second World War. Perhaps it is also possible that while this incident by today’s standards is horrific it pales into comparison with what was to come just over a year later with the start of the Blitz in September 1940 – which would result in the loss of thousands of lives in the East End and across the UK. The disaster in Valentines Park equalled the number of deaths of those under a tree on Wandsworth Common in 1914. Other deaths caused by lighting in London include two women who were killed while walking in Hyde Park in September, 1999. According to TORRO, the Tornado and Storm Research Organisation, about 30-60 people are struck by lightning each year in Britain of whom, on average, three may be killed. You can read further on lightning impacts and safety tips to avoid getting struck here. 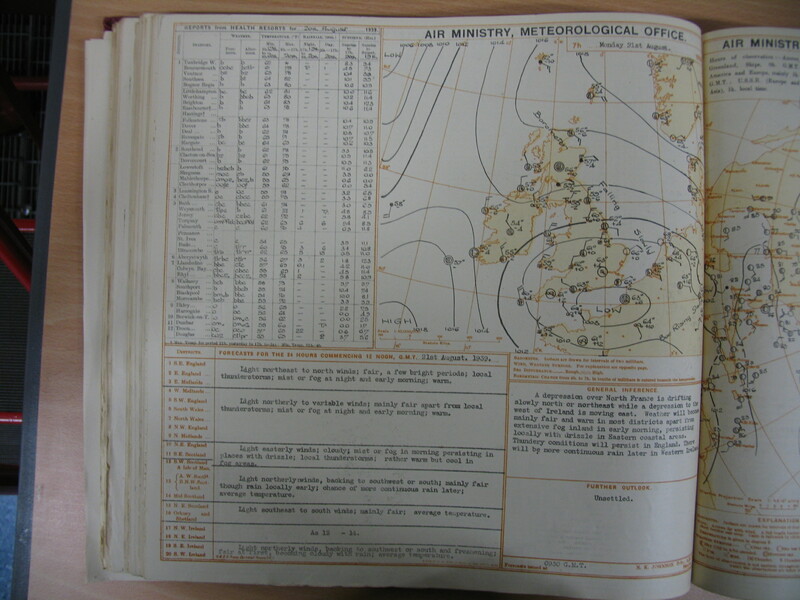 The Met Office also features a page of lightning advice. I would like to thank Redbridge Central Library for their help in accessing the archives for this piece. 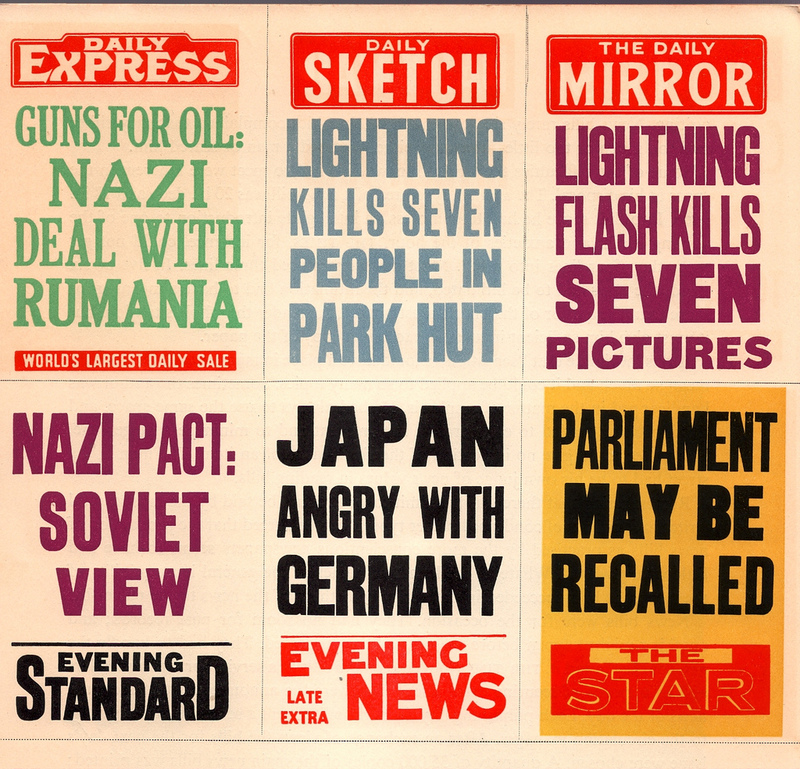 And to Mike Ashworth who kindly gave permission to use the superb newspaper bills montage. You can see Mike’s work at his Flickr site. Thanks also to the Met Office. 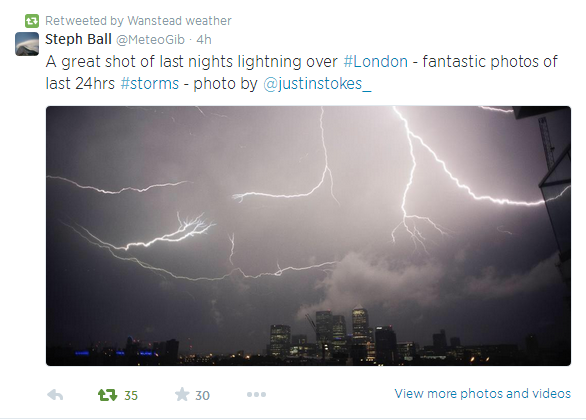 It was the storm that preceded the hottest day of the year when the temperature briefly touched 34C in Wanstead – that’s higher than the official recognised figure of 33.5C at Heathrow and Northolt. Earlier people all around town and across the country wilted in the heatwave waiting for news on the royal sprog, many of them ignorant that things were about to go bang. But no matter – it’s days like this they say is good to bury bad news – so the weather, it seems, decided to get in on the act too. The first spots of rain fell on an exhausted crack Sky News commentary team outside Buckingham Palace just before midnight. About the same time reports started coming in of thunder in Canning Town and Poplar – but all went quiet after three flashes. 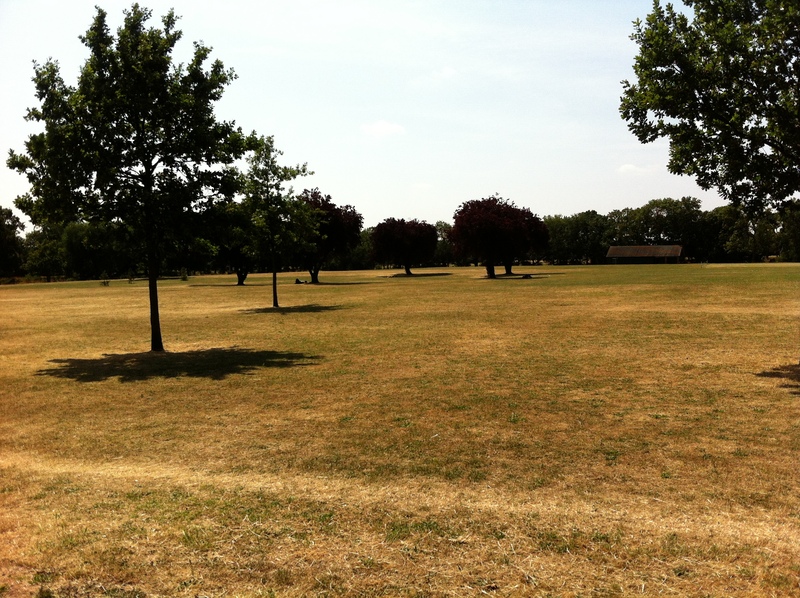 Then 11.58pm reports of rain in Luke Howard’s old haunt – Plaistow. My own ride back from town saw reasonably heavy, if somewhat shortlived, rain in Southwark. Yet by the time I reached Aldgate the ground was dry. Things began to liven up again at 1.30am – distant rumbles of thunder getting closer – further reports of multiple thunder, lightning and heavy rain with hail mixed in at 1.45am. Then, bang, the storm hit Wanstead. I failed to get any footage of the event because of the ambient light washing out every shot. Multiple crashes of loud thunder followed by, at one point, dazzling lightning flashes. You know how close a storm is by counting the seconds between lightning and peal of thunder. At 1.51am I barely counted to one between a dazzling flash and one of the loudest cracks of thunder I’ve heard. Only 6.5mm of rain was recorded, though this fell at a rate of 60mm/hr – the highest rate since I put the meteo live online last November. It doubled the previous highest rate! There followed frequent, distant rumblings of thunder to the east along with copious flashes and occasional bursts of rain. Epping recorded 19mm in two storms at 5am and 6.30am. The thunder and oppressive humidity made sleep difficult. And judging by the number of bleary eyes on the school run this morning I wasn’t alone. 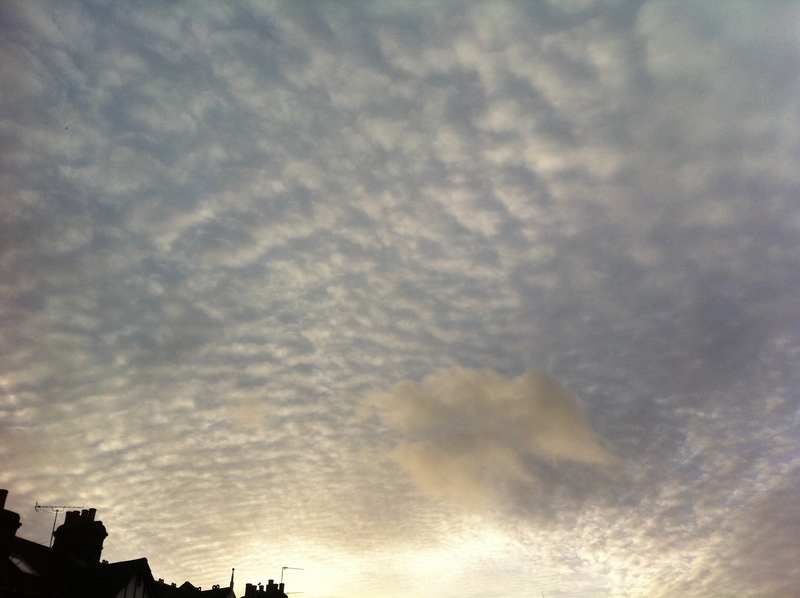 The were other storms around London and the UK – a notable one in Brixton precipitated this account on Brixton Buzz. And Steve Brice managed to capture the lightning in Gillingham, Kent. Pershore in Worcestershire recorded over 56mm of rain in 3 hours while lightning damaged rail networks. It was one of the most dazzling displays I can remember – certainly the best since probably 2000 if not before. People often ask me what first got me interested in the weather. Until last night I’d almost forgotten that thunderstorms were one of the main attractions. A night to remember – just like the overnight storms in the Eighties I remember as a lad. 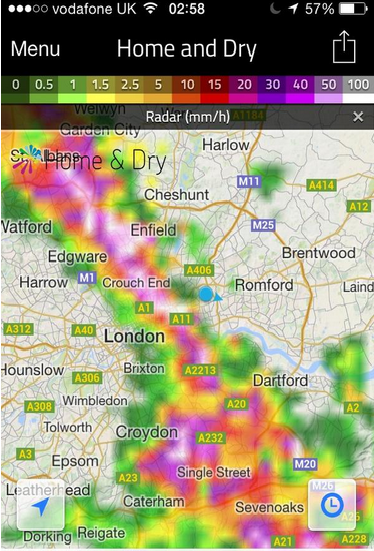 Scott Whitehead @wanstead_meteo http://www.wansteadweather.co.uk with thanks to ‏@loveloughton for storm updates The following charts show the cell well. The 2mb pressure drop, the 60mm/hr rainfall rate, the 2C dive in temperature, and the sudden gust of wind This pressure drop is also reflected in the temperature fall at the same time: 2C in a matter of minutes.